During our last week brainstorming, we realized that the sample-holder design for the detection of Arsenic-GFP reporter was a challenging part. Thus, we organized a meeting with Nina Buffi, a PhD student who worked on a microfluidic bacterial biosensor for the detection, to see if we could get inspired by what she did. In the Cell-beads on chip, cells were immobilized in agarose beads allowing concentration of the bioreporter in cages. These cages are aligned in a microfluidic devices were the cells can be exposed to a continuous flux of Arsenic. 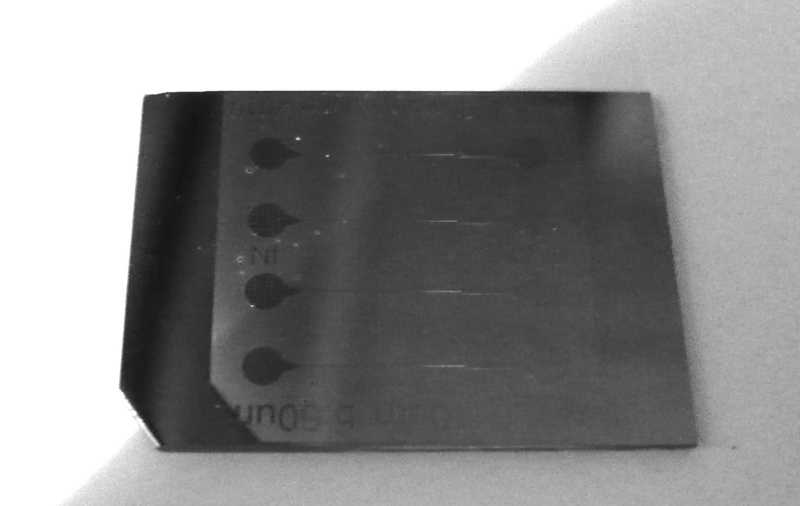 A silicium pattern was used to create these PDMS chips using etching technique. At 4°C, the signal tended to diminish very fast, so the solution was to decrease the temperature to -80°C, which stabilized the output. However, keeping the beads at such a low temperature is not an easy thing to do, especially in regions with less storage capacity. So to deal with this, they increased the temperature to -20°C, which shows an intermediate stability and is more easy to manage. Still, the issue with this method is that the signal output decreases dramatically in time. A solution would be to nourish the cells before exposing them to Arsenic, so that they would reach a more favorable growing state. 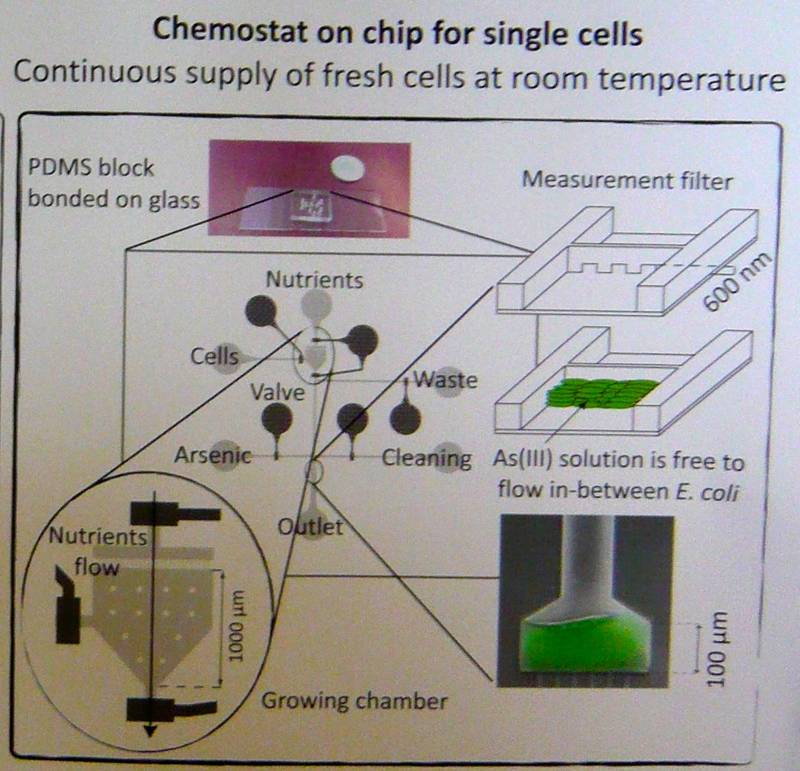 The chemostat on chip allows to grow cells on the chip with help of valves and pressure gradient. 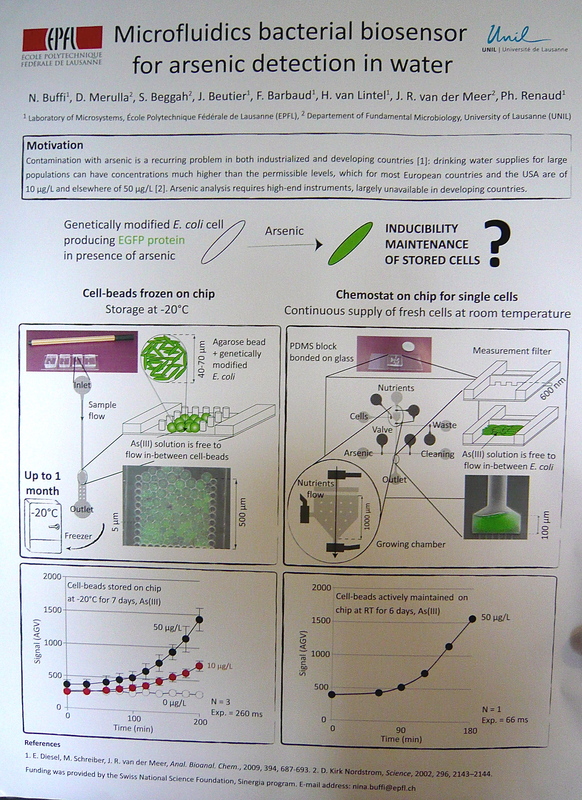 This is an interesting alternative to the first system because there is no need to store cells. The negative point is that this circuit is not very robust and quite complicated to build. For both techniques, Nina Buffi and her team measured the signal with a fluorescence microscope, and used ImageJ, a free image processing software, to analyze the data. The meeting was really interesting and raised questions on how we want to build our device. Obviously, it will not be easy to design a portable, easy-to-use spectrophotometer using this Arsenic-reporter, but this is a challenge we are willing to explore!